I’m Executive Director of Sales for Syniverse’s Enterprise and Intelligence Solutions organization and focus on delivering specialized solutions that enable brands to better engage mobile users. I work at our headquarters in Tampa. I joined in 2009 through Syniverse’s acquisition of VeriSign. I started as Solutions Engineer and moved to a sales role about three years ago, when I first focused on the Latin America market. I transitioned to my current position earlier this year. I’ve been supporting our sales teams on opportunities related to Syniverse’s number identity service. I’ve also been working with our sales team in Latin America on opportunities to provide our mobile engagement services for various customers there. Every single part of our solutions or use cases, no matter how small, may offer unforeseen opportunities and benefits to our customers. I’ve learned in this industry that there are many different ways that mobile can be integrated, and it is important to think creatively about how each solution can address the needs of different mobile user groups around the world. Oftentimes, a part of a solution that may seem small or specific to a particular function for one customer can have a huge impact as far as serving the needs of another customer. The opportunity to work closely with operators in Brazil in preparation for the World Cup in 2014. It was rewarding to implement new technologies and expanded service capabilities to serve a massive audience that descended on several cities across the country over one month. We succeeded in delivering an exceptional customer experience for the visiting soccer fans and great results for the operators. Knowing that good work is consistently recognized. I feel as if this helps us to always be motivated to go the extra mile. I currently have an iPhone 6. I’ve been using iPhones since the 4 model was released. What’s your favorite app or mobile tool? The apps that are vital for me are the travel-related ones, since I spend a lot of time on the road. I use Tripit to sync up the travel details with my phone and to get notifications on changes, hotel addresses, etc. I also use multiple airline apps to check in for flights. But it’s hard for me to single out one app or tool in particular. I use my phone for all sorts of activities, including making bank transactions, updating social media, getting maps, finding out sports news, and playing music, just to name some. What’s the longest you’ve gone without using your phone recently? I don’t think I’ve been away from my phone for more than 24 hours in the last year. Even while on vacation, I tend to check my phone regularly. After just moving from Brazil to Florida earlier this year, I love to spend time exploring the Tampa Bay area with my wife and two kids. In addition to getting to know the beaches and parks in the area, we have been shopping for housing items here. I’m also a huge sports fan, and soccer is my favorite (being Brazilian, what else could it be?). 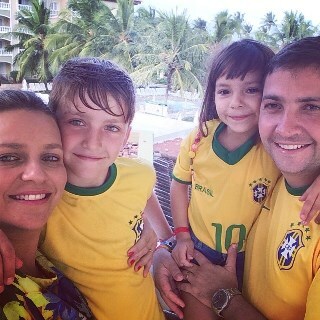 My family and I on vacation in Brazil last year to catch the World Cup games. 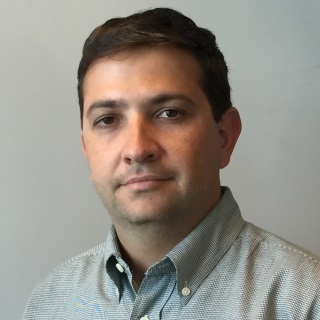 Denison joined Syniverse in 2009 and brings almost 20 years of experience in mobile and information technology services to his position as Sales Executive Director for Enterprise Solutions. In his current role, his focus is on growing Syniverse’s presence in international markets and developing go-to-market plans for Syniverse’s highly specialized mobile engagement services for enterprises. Previously, Denison served in sales leadership positions for Syniverse’s Brazil and Latin America region, after coming to Syniverse through its 2009 acquisition of VeriSign’s Messaging and Mobile Media division. Prior to Syniverse, he held several sales and engineering positions with such technology leaders as VeriSign, inCode Telecom Group and Vivo. Denison holds a degree in computer engineering from the University of San Francisco in Brazil and a specialization degree in project management from the University of São Paulo. Mais que merecido o reconhecimento pelo teu trabalho. Certeza absoluta que voarás muito mais alto.